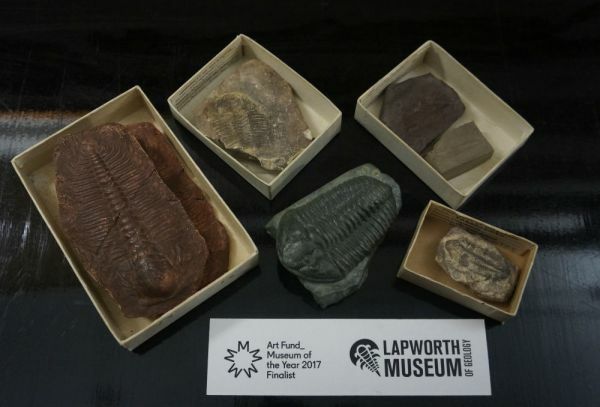 The Lapworth Museum of Geology at the University of Birmingham has been shortlisted in the UK for the Art Fund Museum of the Year 2017, one of the most prestigious Museum sector awards in the UK. To help their nomination, the museum has sent a 3D printed replica of their Dudley Bug specimen (a 428 million year old iconic trilobite - from the Birmingham region) to friends on every continent. They are seeking messages of support from every continent along with an image of the Dudley Bug visiting museums and collections from around the world. One of the Dudley Bug replicas recently arrived in Melbourne in the care of Irene Finkelde, a post-graduate student in cultural materials conservation at the University of Melbourne. Irene was the 2016 recipient of the International Museums and Collections Award, and as part of her exchange at the University of Birmingham worked with the collection and staff at the Lapworth Museum of Geology in January and February of this year. Escorted by Irene, the Dudley Bug replica visited a number of University museums and collections for some photo opportunities, including the F.A. Singleton Geology Museum and the Tiegs Zoology Museum. The Lapworth is using the theme of 'tell us why the Lapworth Museum Rocks?' for messages of support using the hashtags and tags @artfund @lapworthmueum #lapworthrocks #museumoftheyear.